Helen & Chris Road Trip USA: Swarm of Mozzies devour hapless campers!! 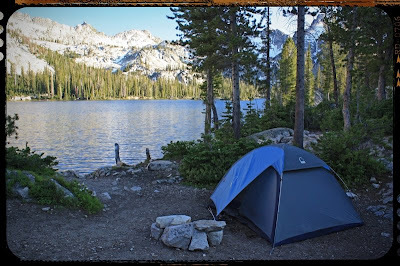 That was us in Sawtooth Wilderness. A seemingly innocent enough camping spot right on the shores of Alice Lake - 6 miles from the trails end, 8500ft up in the Mountains and not a soul in sight. Gorgeous enough but that was us, in that tent before nightfall. Just to escape the incessant mozzies. Hideous creatures. Eating our freeze-dried curry wrapped in all the clothes we had, not so much because it was cold but to build up the layers which the pesky bugs could nibble us through. And yes we had repellant. These ones had obviously been working on their immune system against the stuff. But enough moaning, after all the itching has calmed down now!! After a major winter in these parts the area around the lake still had snow and the river crossings were way more entertaining than this time last year. Thank heavens for Tevas!! We just strapped them on and waded straight across. We had great camping weather too, and got back to the trailhead just in time as the first grey clouds we'd seen all week enveloped the mountains we'd just been trekking through!